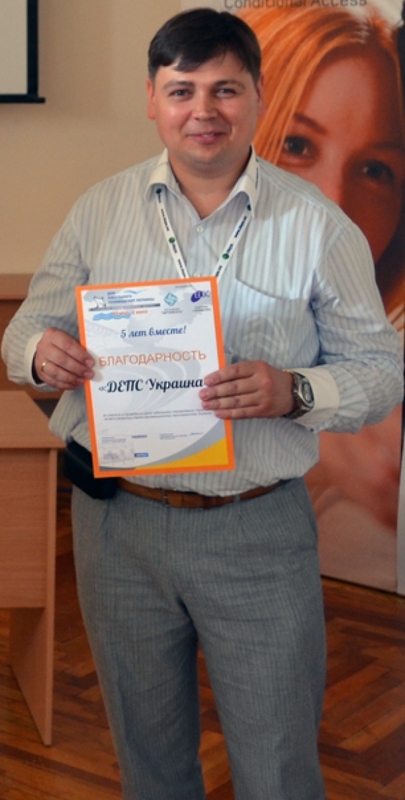 "DEPS Ukraine" took part in "Days of cable TV"
May 29 - June 3, 2012, Park-hotel "Marat", Gaspra, Crimea, Ukraine. "DEPS Ukraine" took part in the biggest event for the market of cable television and communication multiservices - the fifth anniversary conference, the "Days of cable TV". "Ukrteleset" association together with "TECHEXPO” were traditionally organizers of this event. This year's conference attracted a record number of participants - over 430. The event was attended not only by Ukrainian companies, but also by representatives from the CIS countries, European Union, the USA. “Days of cable TV” program, as always, was full of subject activities for the cable TV operators, broadcasters and content providers, for technology suppliers, and other participants of information and communication services market. Within 5 days of the conference the participants took part in numerous presentations, seminars, forums, round table discussions, shared their experiences and just rested.. Specialized technical conference "Equipment, technology and solutions for cable networks" gathered huge audience. David Mitchinson the Solutions Manager from the Appear TV, Norway ,gave a lecture on "The functionality of transcoding and encoding of Appear TV - the development of the philosophy of universal headend Appear TV". The presentation was devoted to Appear TV headend stations - the expansion of modular headend functional, any input, any output, and now encoding and transcoding and OTT functional were also added. Two redundant internal switch modules that are connected to the main and redundant channel it means 100% signal recovery without FEC using. Due to the rapid development of modern trends in telecommunication technologies "Ukrteleset" association organized new seminar for “Days of cable TV " -“ Future business directions in multi-service environment". Cable operators learned about promising practices in networks development , about new services for subscribers and additional ways to increase profits. Andrew Vladika, "DEPS Ukraine" chief engineer of system integration department made a report "Moving from Analog TV: key motivation to digital TV transition," . He spoke about the mechanisms of attractiveness increasing of digital TV services for end users, ana how to increase revenues from digital TV services provision. He also highlighted technical and organizational aspects of costs reducing for digital TV services, as well as mechanisms for additional direct and indirect revenues obtaining. Special attention was paid to providing services approach, to the the major problems disclosure and to "pitfalls" which providers faced during digital TV services organization. Yevheniy Yevtushenko, "DEPS Ukraine" Business Development Director reported to the listeners about "Monetizing of OTT services ", stressing first of all on the question" OTT – is it a threat to traditional operators or a new opportunity to make money? ". Various options for business models changing in order to obtain additional income for free content were considered. This report has caused a great interest among the audience, and was followed by a lively discussion and a lot of additional questions to the speaker. Each question received a detailed response. “Days of cable TV “ photos can be seen in our photo gallery.